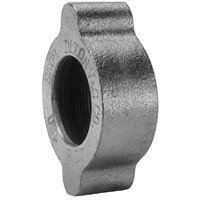 # DIXB67 - GJ Boss Ground Joint Seal - Wing Nut - 6 in. Positive Metal-to-Polymer Seal. A leak proof seal is formed when the metal head of the stem makes contact with the patented polymer seat in the spud. The non-metallic polymer seat resists most chemicals found in manufacturing facilities. (reference corrosion resistance chart on pages 600-605). Recommended for steam service up to 450°F. Easy to seal. Works with existing fittings. Plated steel and / or iron. Hose Shank x NPT 6 in.